In the 1900’s women were not perceived as strong and as intelligent as men. They were known as household maidens and wives. Amelia Earhart changed all of the current perceptions of what a woman’s role was. Earhart was the first woman to fly across the Atlantic Ocean. She inspired women to follow their dreams no matter what challenges they faced. She led a generation of women to seek their highest potential. Amelia Earhart was born on July 24, 1897, in Atchison, Kansas. Her parents, Amy and Edwin were encouraging and supportive even when it came to their daughter Amelia playing sports. Their encouragements did not faltered when Amelia found or discovered that she wanted to fly. In October 22, 1922 she set a women’s altitude record of 14,000 feet. On July 6, 1930, she set a women’s speed record of 181 miles per hour. In May 20-21, 1932, Earhart accomplished her goal of flying solo across the Atlantic Ocean. Her next major achievement was to set the women’s nonstop speed record. She flew from Los Angeles, California, to Newark, New Jersey in a record of nineteen hours and five minutes on August 24-25, 1932. In July, she set a new speed record, making the same flight in a record of seventeen hours and seven minutes. Earhart continued setting records. Her first attempt flying around the world began on March 17, 1937 in Oakland, California but ended with a runway crash in Hawaii, after a tire blew. Earhart repaired the damages and tried again. Earhart’s example made it easier for other women to go out and accomplish their own goals and be their own hero. 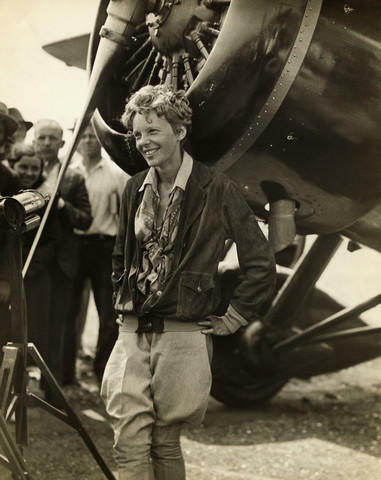 What turned out to be the final flight of her career, Earhart was quoted saying, “I have a feeling there is just about one more good flight in my system and I hope this is it. Anyway when I have finished this job, I mean to give up long distance stunt flying” (Earhart). It happened at Howland Island, a tiny island in the Pacific Ocean. She had no idea that there would be severe weather, heavy clouds or rain. Earhart reached her destination, disappearing somewhere off the coast of the island. A large search party was quickly organized, but no remains of her or the plane were ever found. The United States government spent four million dollars in search of Amelia Earhart. Earhart was only thirty-nine when she died. There were many theories about her disappearance: The plane ran out of fuel; she was on a spying mission and was captured by the Japanese and executed; or she survived and returned to live in the USA, hiding her identity. Her death will always be an unsolved mystery. Earhart is a hero because she showed that a determined woman could achieve anything. “A thing of rusty wire and wood and not at all interesting” said ten-year-old Amelia Earhart as she described her first sight of an airplane. She had no interest in airplanes, but she later became one of the first few women pilots in the world. After a ten minute flight of flying, it soon became her passion. 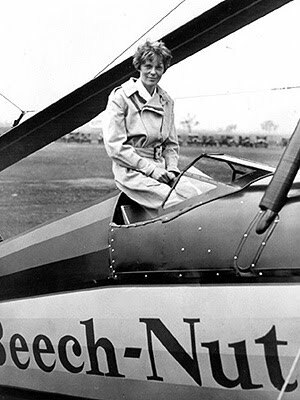 She said, “I believe that little red airplane said something to me as it swished by.” Earhart had a passion for flying and her later accomplishments inspired others and helped pave the way for others. She led a generation of women to seek their highest potential and inspired women everywhere to do great things. Earhart taught people that you could achieve anything. She said, “Courage is the price that life exacts for granting peace. The soul that knows it not, knows no release from little things.”(Think exist.com) This shows that it takes courage to find perspective and understanding as you handle life’s challenges. It takes courage to look at the bigger picture; you can’t lose yourself in life’s little details. “Women must try to do great things as men have tried. When they fail, their failure must be but a challenge to others” (Brainy Quote). This shows that we never really fail when we try something new. When we learn what doesn’t work in our first attempts, we have a better chance of success the next time. That’s a part of what makes Earhart an inspiration to others. Many people admired Amelia Earhart because she was not afraid to go against what was expected of women. Her spirit and determination was an inspiration to others in her time. Amelia Earhart’s dream was to fly around the world. It didn’t matter to her what others said, she accomplished her dream despite what others said. 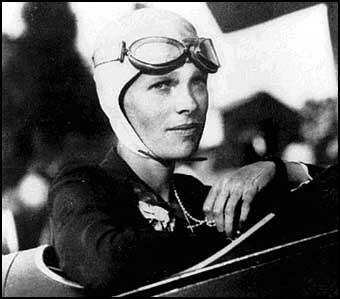 Earhart said “Adventure is worthwhile in itself” (Brainy Quote). This shows that the steps along the way are as important as the destination. She also said, “As soon as I left the ground, I knew I had to fly.” (Women’s History)This shows that her experience led her to a lifetime of longing to fly. She got the recognition of the first woman to fly across the Atlantic Ocean. The fact that she was driven and focused at the time when the nation was struggling and when women weren’t successful in a man’s world, made her stand out. She made people think, “What is my dream?” People hadn’t been thinking of dreaming because of the Great Depression and when she dreamed of being the first women to fly across the Atlantic Ocean, she opened their minds and hearts to their own dreams. Amelia Earhart is not only an inspiration to women everywhere, but a hero because of her courage to fight against gender stereotypes and her determination to accomplish her goals and dreams. Earhart, Amelia. "Amelia Earhart." "Earhart, Amelia (1897-1937)." DISCovering Biography. Online ed. Detroit: Gale, 2003. Student Resource Center - Gold. Gale. DEL NORTE HIGH SCHOOL. 19 May. 2010. Gale, Anthology/Collection Jan 1, 2003 - Current. Web.19 May 2010.Earhart, Amelia. "Amelia Earhart." "Earhart, Amelia (1897-1937)." UXL Biographies. Online ed.Detroit: UXL, 2003. Student Resource Center - Gold. Gale. DEL NORTE HIGH SCHOOL. 19 May. 2010 .. Gale, Anthology/Collection Jan 1, 2003 - Current . Web. 19 May 2010. Earhart, Amelia. "Amelia Earhart." http://www.nndb.com/people/943/000026865. Copyright ©2010 Soylent Communications, n.d. Web. 19 May 2010. Earhart, Amelia. "Amelia Mary Earhart." 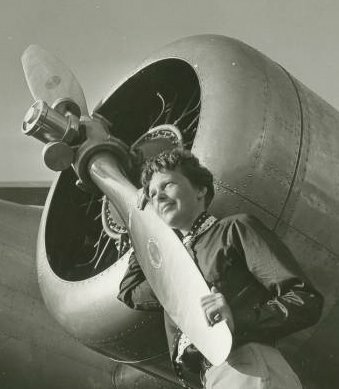 Stong, Jennifer L. "Earhart, Amelia Mary (1897-1937)." Encyclopedia of World Biography. Ed. Suzanne M. Bourgoin. 2nd ed. Detroit: Gale Research, 1998. 17 vols.Student Resource Center - Gold. Gale. DEL NORTE HIGH SCHOOL. 9 May. 2010 .. Gale, Encyclopedia Jan 1, 1998 - Current . Web. 19 May 2010. Earhart, Amelia. "Brainy Quote." http://www.brainyquote.com/. Copyright 2010 BrainyMedia.com , n.d. Web. 25 May 2010. Earhart, Amelia. "Think exist.com." http://thinkexist.com/quotes/amelia_earhart/. Copyright ® ThinkExist 1999-2010, n.d. Web. 25 May 2010.